Despite its name, the feeling is far from rustic and the demands far from taxing down on The Farm, set near Jaipur in Rajasthan, India. 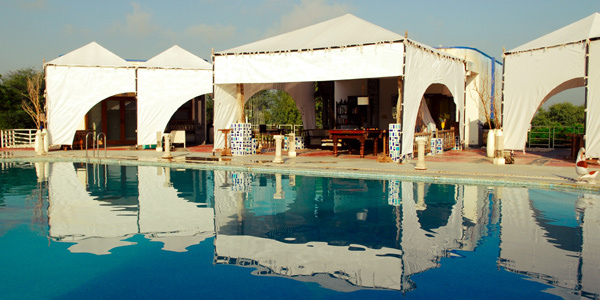 Instead, guests are treated to a family-friendly oasis with a huge pool, welcoming hosts and pretty, sprawling grounds. The indulgence isn’t limited to the outside either: the rooms are spacious and eclectically designed, with eccentric but tasteful furnishings throughout. 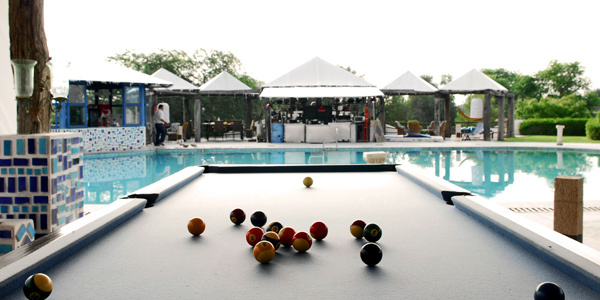 The fact that owners Ritu and Surya have their own son, Vihaan, is clear from the kid-friendly details: an abundance of games and toys, a shallow end to the pool, and plenty of safe gardens to run around in. 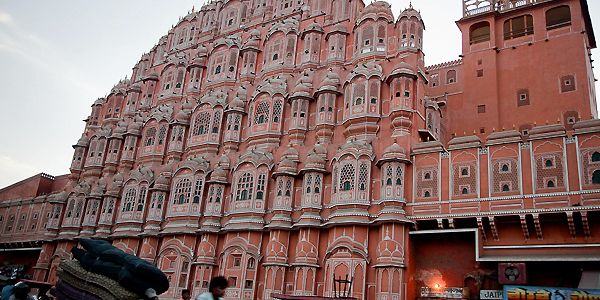 Nearby Jaipur – the ‘pink city’ – is a great point of access to beautiful Rajasthan, and its impressive forts are an absolute must see for all ages. Rooms: There are 5 rooms and 2 suites, and families would be comfortable in either category. The large, themed suites sleep 4 and have their own private dip tub; they’re set in the garden and so offer a little more privacy. The rooms can fit an extra bed for kids, and we’d recommend those adjacent to the lawns, pool and deck. 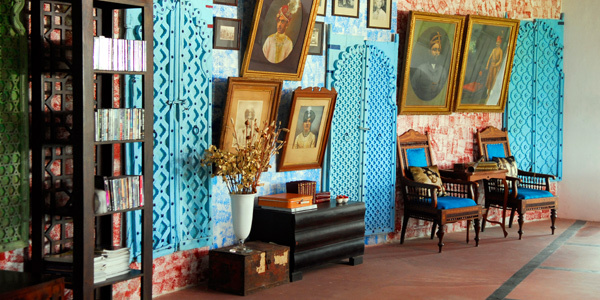 Each is distinctively styled with its namesake colour (Pink, White, Red, Green or Blue and White) in mind, and all have bright windows, atmospheric lighting and choice furnishings which reflect Jaipur’s culture and history. As well as the bedrooms, there’s also a fantastic communal room on the ground floor. Inside are mounds of photo-art cushions, plus a billiards table, books and games, and a widescreen TV with an eclectic range of DVDs (many suitable for kids),. Food: All the food is included in the price and is utterly delicious – let Rita and Surya know the ages of your kids and they’ll make sure suitable meals are available. Dinners can be served earlier to help with bedtimes, and parents have access to a blender and microwave if needed. 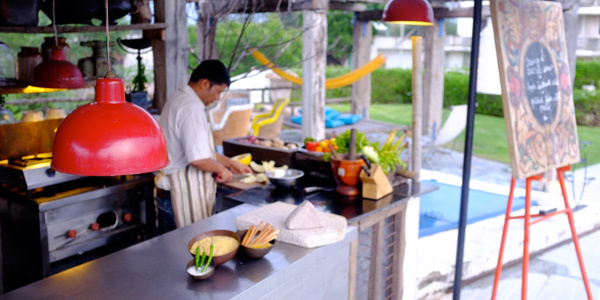 The food is also increasingly home-grown and seasonal, giving a fresh and varied menu. You can expect exciting dishes such as pumpkin and pesto soup, Tandoori chicken legs with a hot salsa dip, and melon and cucumber with feta and a vinaigrette dressing. If you have older children with patience and/or a love of food, they’ll adore the sprawling 5-course dinners eaten beneath the stars. And if all this feasting inspires you to delve deeper into the local culinary scene, cooking classes are available and the hosts can direct you to some wonderful eateries in Jaipur. Kids’ activities: The hotel and its grounds are wonderfully child-friendly. You’ll find a swimming pool with a shallow end, an outdoor playground and plenty of space; there’s even a mini golf course in the planning. Inside is the usual supply of books, games, puzzles and DVDs, as well as fun pottery classes specifically for children – perfect for when you need to retire from the heat of the day. Beyond the hotel’s grounds, kids will enjoy the nearby waterpark (15 minutes’ drive), as well as jeep rides around the local village and the impressive forts around Jaipur (including the imposing Nahagrh, aka Tiger Fort). Baby equipment: If you’re travelling with a baby you can expect bottle warming, pushchairs, potties and a nightlight, though bear in mind that cots are not available so you’ll have to bring your own.